A few days ago, I decided to do something I hadn’t done in a while. Street photography. On foot. A good, old-fashioned photowalk. I don’t do nearly as much street photography as I would like to. It’s probably because of all the genres I’m interested in, I find this the hardest. You can’t very easily stage a street photograph, you can’t set everything up on the table by the window, take a dozen pictures of it from different angles and select the one you think is best, you can’t always prepare to be in position before it happens, whatever ‘it’ is. And if you miss, the moment is gone. You don't get a second chance, you can't adjust the light, move something out of the way, come back tomorrow. Perhaps, that is what Henri Cartier-Bresson meant when he said, “Life is once, forever.” A good street photograph has as much to do with serendipity as skill. Street photography is HARD. And I wish I were better at it. But that’s not such a bad thing. I think it’s important sometimes to go back to something we’re not very good at or comfortable with and make an honest effort to improve. I see so many photographers who think they’re an authority on the subject the day after they’ve gone out and bought their first SLR. I went to Flickr the other day to search for street photography in Mumbai, and was very quickly disheartened by the volume of rubbish I found. Most of the pictures were nothing more than shots of people and traffic on the street. Street. Photography. But definitely not street photography. If you miss, the moment is gone. You don't get a second chance, you can't adjust the light, move something out of the way, come back tomorrow. This should hardly have come as a surprise, as all photographic genres must be plagued by the digital detritus created by thousands of casual shooters and self-proclaimed experts and pinned up on that infinite virtual wall of the worldwide web. Yes, street photography as a genre is hard to define (it doesn’t even have to be on the street), but you know it when you see it, and you can tell the wheat from the chaff. Check out some of the work by Marius Vieth, and you’ll see what I mean. If I could shoot street half as well as Marius does, I’d be a very happy man. We all know the pioneers who put street photography in the spotlight – Robert Frank, Garry Winogrand, Lee Friedlander, Joel Meyerowitz and Bruce Gilden, to name a few – but there are some modern photographers such as Eric Kim and Yanidel who, along with Marius, have pushed the genre further and made it their own. 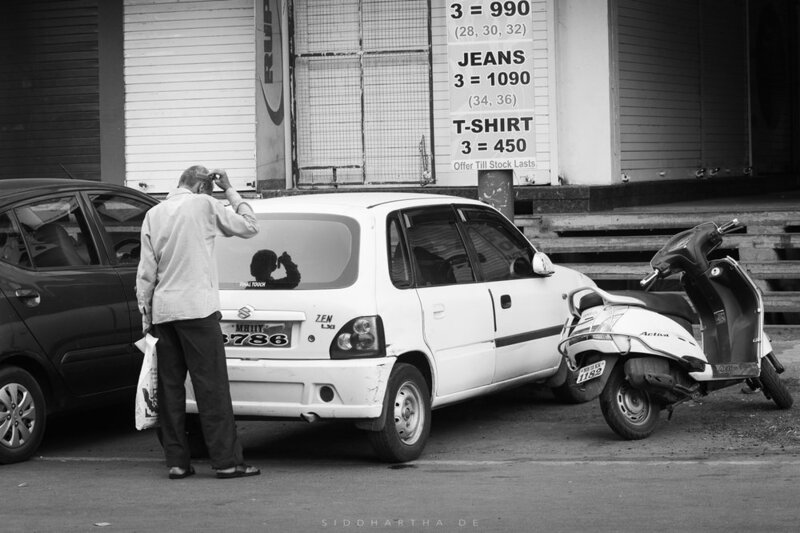 Closer to home in Pune, Swapnil Jedhe is another photographer whose work I’ve begun to admire. I think street photography should be about action. About fluidity. A moment that would have passed if you hadn’t frozen it that instant. I don’t think taking a shot of the fire hydrant on the corner would qualify. I think a good street photograph should make the viewer ask questions. It should make the viewer want to turn the page and see what happens next. It should make the viewer FEEL the scene, the smells, the sounds, the mood. Street food in India (as in most other places, I would imagine) is very popular. The choices are endless, and there are neighbourhoods in most Indian cities that would be impossible for you to walk through without stopping to satisfy the cravings brought on by the aromas of kababs, tandoori chicken or chaat. I took this picture of a bawarchi standing over his tandoor, cooking up his magic for the evening Iftaar, the ritual feast at the end of the day-long fast during the month of Ramzan. It's quite possible that this man is a Muslim too, and probably hadn't eaten all day himself. Yet he was standing there, over the intense heat of the burning coals, hour after hour, to provide food for others. The embers from the tandoor bring this picture alive. This was a shot I took while crossing a street in Boston. The spire of the church pointing up towards an interesting sky made for a nice shot, but it was the frozen action in the frame that appealed to me. The cyclists reading the signs on the street corner, the woman and her dog halfway across the street, and the family just about to cross it. Where were they coming from? Where were they headed? A second later everything changed. I was walking along a street in my hometown one morning, when I saw this man pause to look at his reflection in the rear window of a car. I wasn't sure what he was about to do, but I thought it would be worth my while getting my camera ready. Just in case. He then took his comb out of his pocket to make what was left of his hairline a little more presentable and, without knowing it, presented me with a Kodak moment. That the sticker on the window spelt out the words "final touch" was sheer serendipity, and I knew it was just my good fortune that I was at the right place at the right time. So how do you try to get better? At street photography, anyway. You first recognise you’re not there yet. You have a way to go. You study the work of those who are further along the road than you are, those you look to for light. You go out there and shoot. And make mistakes. And learn from those mistakes and go out there and do it again. There’s some comfort in knowing you have a place to fail, to create work that’s not good enough, but to have the freedom to be unashamed of it. There’s no pressure there, unless you burden yourself with the expectation or, God forbid, the illusion of mastery without having walked long enough along that hard road of learning that gets us all there. We seem to get too focused on the apparent pressure to succeed fast. To cross some unseen finish line ahead of some unseen competition. Winners straight out of the gate. So focused, in fact, that we forget to enjoy the journey. I don’t know if I’ll ever be as good a street photographer as I’d like to be. But I’d like to keep trying. I’d like to go out there and keep shooting, keep watching and learning. Maybe I’ll get better at it. Maybe I won’t. But at the end of the day, I know I’ll have spent time doing something I love and walking a little further along on this journey, which is what it really should be about.